Making bold statements in your first press conference can sometimes come back to haunt you. 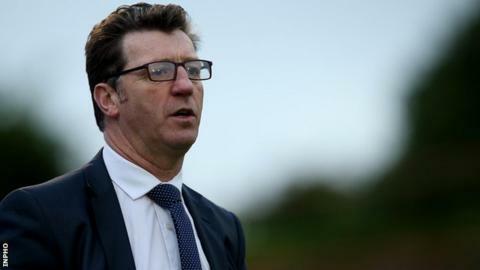 After being handed a one-year contract as Derry City manager last November, Roddy Collins declared he was here to win the league. With just two wins from twelve league games and the club only two points off the relegation play-off position, the Dubliner's brief reign at Brandywell was brought to end on Sunday night. With a chequered managerial CV, his appointment received mixed reaction but his brief was to improve the club's fourth place finish under Declan Devine the previous season - which incidentally was enough to qualify the Candystripes for Europe. The team has not won in the league since a 3-2 victory over bottom of the table Athlone Town on 11 April - a run of five games which has included four draws and last Friday's 1-0 defeat at home to Shamrock Rovers. A victory over Sligo Rovers in the EA Sports Cup earlier this month did offer some hope of a change in fortunes and there is no doubt that Collins has improved the team defensively this season. However, with little sign of improvement in terms of results over the first third of the season, his departure seemed inevitable. "We need to qualify for Europe and, at the moment, we are a long way from that," club chairman Philip O'Doherty told BBC Radio Foyle. "Results have just not been acceptable." There have been other factors that have led to his downfall as well. His management style and unattractive brand of football had made him unpopular with fans, which resulted in dwindling attendances at Brandywell this season. In recent matches, the final whistle has been greeted with a chorus of boos around the Lone Moor Road venue. Collins made 10 signings in pre-season despite saying initially the squad only needed "tweaking". He appeared unable to identify his best starting 11 regularly making several changes in his team selections every week. As a result, his drastic overhaul of the squad backfired spectacularly. In addition, there have also been rumblings of discontent in the dressing room and there was a much publicised fall-out with last season's leading goal scorer Rory Patterson. The former Northern Ireland international was dropped from the squad for two matches and relegated to the reserves before eventually being restored to the starting line-up. It's also understood there was a disagreement with his assistant manager Peter Hutton last week with the ex-skipper absent from the Shamrock Rovers game and sent instead to watch this week's opponents Cork City in action at St Patrick's Athletic. In his post match interview after the defeat to Rovers, Collins described the outcome as "their best performance of the season". Yet 48 hours later, the game was up with the club chairman O'Doherty claiming that Collins was "relieved" at the parting of ways. The big question now is, where the board turn next? In the meantime, Hutton and first team coach Marty McCann are in charge of first team training and there is speculation linking last season's assistant manager Paul Hegarty with a possible return until the end of the season at least. Institute manager Paul Kee and Kenny Shiels - who recently left Scottish club Morton - could also be in the frame. With the club's precarious league position, the City board will be under pressure to make a quick appointment and bring stability back to Brandywell.